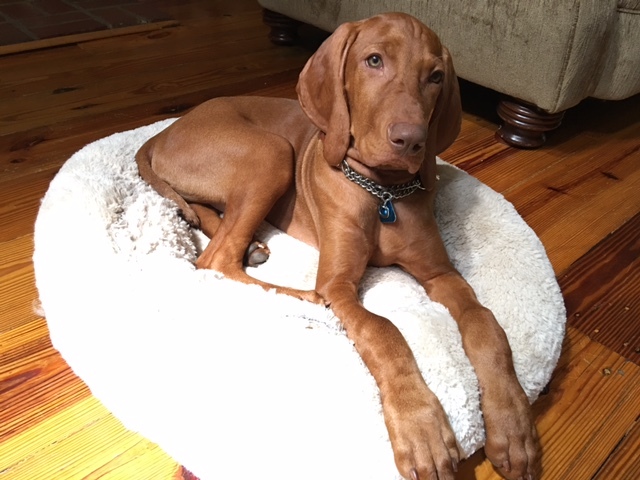 Last weekend we drove up to Valdosta, Georgia to personally deliver our beloved 3 month old male pup Country of Origin Frakk to his new owners, Sammy, a Veterinarian who is also a hunter and his wife Ginger. This was their first Vizsla having had only German Shorthaired Pointers in the past. I got a few texts and emails the last couple of days and this is what they have had to say about Frakkie: “He is doing fabulously well. He is sitting on command and comes when called. He and our red cat hit it off from the first moment. He is bright, affectionate, calm, mannerly and wants to please. Sammy is thrilled with him…more than he could ever have imagined! Frakk’s intelligence and affection shows in the eye contact he makes. Everyone who has had interaction with him has been VERY IMPRESSED. He is everything we wished, hoped and prayed for. We are so appreciative and grateful that you shared a piece of your heart with us. THANK YOU” Sammy & Ginger, Madison, GA.